Ubisoft is finally unveiling Assassin's Creed 2 a bit more today. No images of the game unfortunately, but a few artworks and more importantly a quite informative Q/A session. Update: Added the teaser trailer. Could you introduce yourself and explain your role in the project? My name is Sébastien Puel. I am the Producer on Assassin’s Creed 2. My role is to manage the production team and to ship the best game. On which platforms will Assassin’s Creed 2 be available? 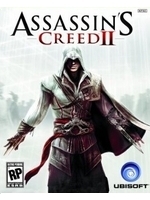 Assassin’s Creed 2 will be available on PS3, X360, PC and also on PSP. I am in charge of the PC, X360 and PS3 versions. Assassin’s Creed 2 will be released during Holiday 2009.
Who is in charge of the development? The game is mainly developed by Ubisoft Montreal on PS3, X360 and PC and more than 300 people are currently working on the project. How is Assassin’s Creed 1 linked with Assassin’s Creed 2? Assassin’s Creed 2 is the direct sequel of Assassin’s Creed so of course, there are a lot of similarities, but the team is working very hard on increasing the overall scope of the game structure and on adding more depth and variety to the core Assassin’s Creed game play. Apart from that, there are many other links with Assassin’s Creed. We are using the Scimitar/Anvil development engine that was conceived for the first Assassin’s Creed and used for other games such as Prince of Persia and Shaun White Snowboarding. Also, we have a technical team working hard on upgrading and adding new features to Anvil. Through the years of working with this engine, we have gained a great deal of knowledge and experience. What new things can we expect in Assassin’s Creed 2 that distinguishes the experience from the one we enjoyed in Assassin’s Creed 1? What are your ambitions behind one of the biggest and still young franchise in the video game industry? What is the storyline of the game? To help the assassins in their quest, Desmond will be exploring his DNA to find another ancestor’s memory: Ezio Auditore Di Firenze; a nobleman who lived at the end of the 15th Century in Italy. Betrayed by the ruling families of Italy, Ezio embarks upon an epic quest for vengeance. To his allies, he will become a force for change - fighting for freedom and justice. To his enemies, he will become a boogey man – dedicated to the destruction of the tyrants abusing the people of Italy. On his quest for vengeance, Ezio – and Desmond through Ezio’s story – will uncover a much bigger plot: A conspiracy rooted in Assassin’s Creed and that still impact the world of Desmond – our very world. Why did you choose the Italian Renaissance as the next setting for Assassin’s Creed? When we defined the Assassin’s Creed franchise, we knew we wanted to talk about pivotal periods in history: the moments where everything changes, that define the world in which we are living today. That was exactly the case with the first Crusade: this period defined the balance of power between Civilization and Religion for the centuries to come. So when we started Assassin’s Creed 2, we asked ourselves the same question. What is the next defining moment in History? The answer was pretty easy to find: in a few years and in a very small place, a handful of men of genius radically changed EVERYTHING; they invented a modern vision of the world, where men were at the center rather than God. They invented a new way of representing the world (the invention of perspective), they changed politics, architecture, the art of modern war and diplomacy – they invented the banking system as we know it and even advertising! One man even invented planes, helicopter and tanks! Those men were Botticelli, Machiavelli, Leonardo Da Vinci and the Medici. The place is Italy. The time was the end of the 15th century and it is called Renaissance, literally a Rebirth. This is the History as we learnt it. But those were also cruel times, ruled by war, treason and murder! Of course we found very interesting to picture this in an Assassin’s Creed game and cast a new light on those astonishing events. What can you tell us of the art style of the game and the general visual experience the game will offer in bringing the 15th century Italian Renaissance to life? Visual quality and its accuracy to the look and feel of the period is a big part of the franchise. From a strict technical point of view, we have the chance to work with great tools – and the best thing is that we also improved on this side since Assassin’s Creed 1. Assassin’s Creed 2 will feature better lighting and even more detailed environments than Assassin’s Creed. But certainly, the most important thing is that we are now playing with some of the world’s most beautiful urban environments: Venice, Florence, Tuscany are all a real treat for the eyes in 3D just as in real life. Our art team managed to perfectly render not only the streets, houses, water canals and beautiful palaces of those cities, but also the unique mood and light of Italian cities of the 15th century. Walking at night alone in the maze of streets that defines Venice is a real fantasy come true… Now, exploring Venice will be possible directly from your living room. Assassin’s Creed 2 presents us with a new protagonist. We see that Ezio has a new appearance and probably a much different personality since he is not from the same era. What have been your inspirations behind the design of Ezio? Can you describe some of the new skills and movements that will make Ezio a masterful assassin? Ezio will have a whole new set of aptitudes in different fields – to navigate the world, to stay out of sight, to fight and to assassinate. In terms of navigations, we, of course, wanted to adapt the main character to the new environments in the second game. Since a good part of the action takes place in Venice, Ezio is able to dive and swim. Expect to be able to strategically use those new skills to your advantage for various missions. Ezio will also have the possibility to blend into any kind of group of citizens in the crowd, making the navigation all the more fun and believable. Also, he won’t have to be static in a group; players will be able to move in a group while blended and really roam around the city from one group of people to another. The crowd is a central element in Assassin’s Creed and for the second game; we really want the players to feel that every NPC is an opportunity. The free-running in the cities is more fun and fluid than ever. We have developed new abilities and cool moves that will feel fresh when running in Venice and keep the player on the spot while climbing a building. The new “climb leap” move gives the player the opportunity to launch himself a couple of meters high in the air while climbing a vertical building to reach a higher ledge that would be inaccessible without this move. The Renaissance is famous for having been the crucible for some of the most talented and renowned figures of history. Will we be able to meet some of those historical figures? This was one of the main reasons why we chose Renaissance and Italy. When you decide to go there, you’ve got a hell of a cast and lots of information on them! Leonardo Da Vinci for instance is one of the main secondary characters. For Ezio he is at the same time a mentor and … a weapon crafter. Expect some surprises from this genius mind, one example being the double hidden blade. The player will also be able to meet some of the Legends of this time: the Medici, Machiavelli... When doing our research on these historical characters, we were fascinated by all the cool stories we could tell about them and how we could use recorded facts and tweak them so that it suits our story very well. We want the players to learn about these characters and specific sides of them, both factual and fictional. We are proud to say that the Assassin’s Creed franchise is one of the rare games that can serve as an excellent source of information and knowledge for an historical period. The Renaissance is much richer in terms of archived information over the Middle Ages and we could really push our research to make the best story possible with many historical characters. The entire game play/mission structure in Assassin’s Creed 1 was semi-linear and kept the same structure through the 9 assassinations. Will Assassin’s Creed 2 feature more missions and a wider variety in the structure and how the story unfolds? We are now telling a story in a way that is intended to be very unpredictable. There is no more ‘X assassinations’ to perform but a story that develops through a great amount of mission givers. Some will give you an assassination mission, others an intimidation or information-gathering mission etc… There is no limit now to the types of challenges we can give to players. We are very careful on creating a lot of variation in the types of gameplay and pace we are proposing. But we also want the player to have a real freedom and opportunity to explore and ‘use’ the world we have created, at his own pace. Cities are now filled with a great amount of missions that the player can do if he chooses so: for instance, you can now decide to get rid of witnesses if you feel you are getting too famous after a not-so-stealthy assassination, or help thieves pursued by guards. Each of these tasks are optional, but will bring you interesting rewards if you accept to fulfill them. Crowd interaction was one the big promises of Assassin’s Creed 1. How will you improve the crowd interaction for the second game and the role of the NPCs for blending/stealth/attack…? In Assassin’s Creed 2, you have been betrayed by the ruling Italian Families – you will have to learn how to interact and use the ‘common people’ or, like we call them in the game, “the underworld”, to get your revenge. So you can generally consider that the crowd is on your side (except of course if you behave too badly!). First, any crowd NPC can help you to hide – just go into a group and press the blend button to enter a crowd and lower your chances of being noticed by guards. The crowd can help you to stealth through the city but aren’t 100% stealth proof as guards have various awareness levels depending of their class. We have also added a new “notoriety system” where your actions in the city will impact your notoriety and how you are “wanted” in the city. You will get more updates of the “notoriety system” soon. There are many other features in the game related to the use of crowd and we will definitely reveal more in the coming months. Have you implemented any new forms of less traditional gameplay? For Assassin’s Creed 2, there will be various new types of gameplay to break and vary the flow of the game and add intense “WOW” moments, one of them involving a certain flying machine that Leonardo Da Vinci conceptualized and developed. Ezio will be able to launch himself from a high point in the air flying around the city to reach specific location quickly and with the effect of surprise. Travelling with the flying machine will require precision and timing. But I am not sure if I will like this character. Don't like the whole Italian-womanizing-dressup-romeo-thing/vibe I get from this guy. Altaïr was different in a good way. If they have unique side missions, don't have much QTE (yes the game has that instead of cutscenes) its all good. PS. Love Ezio's design (except the cloth hanging on his left side shoulder), but a great design non the less. E3 is a bit far away, can't wait for that event! sounds amazing. If they improve those little flaws the first game had, this is gonna be a classic. I agree with the outfit.. Altair had a better outfit but Ezio has two blades. It's a multiplatform game, why waste money for a new console and a new game for one single game that is multiplatform. Unless you don't own a PS3 or a PC that can run this. I thought Altair's outfit compared to Ezio, Altair didn't have much character within the outfit, was very simple. But time has gone forward and the design of the character has amped up, has more character and smaller details to make it looks better. simplicity is good imo. nothing worse then an over designed character. in a way unbisoft kinda shot themselves in the foot when they designed altair, because they created quite an iconic appearence. and now they have to try to mimic it for different time periods while chaging it enough as not to stand out with everyone else of that period. and they did a good job with ezio, but i think altair looks a damn sight cooler. I don't see how Ezio is over designed, some designed can be over designed but they can also be in a very elegant and sleek way, and Ezio's design fits that section. I agree, Ezio's design looks fantastic and I think it fits in very well with the time period too. i never said ezio was over designed, i simply said altair was based around simplicity, which makes for a far better chracter design imo. as i said, ezio works well, but he isnt a patch on altair. but as i've said in the main forum, as the time periods become more modern in the series, it's going to be hard to incorporate elements of the costume into the new designs simply becasue it is going to stand out a lot compared to the NPC's. i mean, can you imagine trying to incorporate the peaked, bird-like hood into a modern day assassin, it would look rediculius, and thats what i mean when i said ubi may have shot themsevles in the foot with altairs design. especially considering the frachnise is open to jump from one time period to another with each sequel. Ezio's design is badass compared to what todays character designs are done these days. But good thing I love both designs. If Ubisoft have made Altair and Ezio design so badass,I have faith they will figure something out for the modern day, like I mentioned before, Alex Mercer from Prototype looks awesome to be a modern Altair like design. Besides, you are forgetting one thing. Desmonds face was revealed since AC1, it's not crucial to have a hood on if they are gonna make AC3 in modern day. But good thing I love both designs, but I prefer Ezio's design a bit more. If Ubisoft have made Altair and Ezio design so badass,I have faith they will figure something out for the modern world, like I mentioned before, Alex Mercer from Prototype looks awesome to be a modern Altair like design. yeah, i dont think that comic had much relevance to the story. more a lead up to how the first game was going to play out , you being desmond, but playing out altairs memories. but even there, it's just a regular hoody, with so much emphesis being placed on the "bird-like" nature of the the design. (the beak-like peak on the hood, the wing like skirts of the suit etc) you'd think they'd try to adapt that idea for desmond. not just give him a plain white hoody. kinda dissapointing if that happens. The comic book is revelance to the story, anything that has to do with AC is helping the story, else they wouldn't do it. But that comic book is old so they probably decided to go against it for the game. I rather focus on how AC2 is gonna be like rather how Desmonds future outfit will be like, who knows, maybe they won't even change a damn thing about him. They kidnapped Desmond remember, what makes you think he suddenly have new "cool" outfit. Besides, Ezio and Altair means eagle in their own language, Desmond doesn't mean a damn thing, or anything close to eagle, so what makes you think he has to have a "beak-like-peak" on the hood. Just because Ezio and Altair has that form of hood is because of their names and they wanted to capture their animal likeness. becasue he's a decendednt of the assassins. who so far have all had a bird-like appearence. major continuity issue if he doesnt. maybe the woman (who is also an assassin) can knit him up a nice costume to prance about in for the final game? Who knows, I frankly don't care much. They should just make a great game simple as that. I agree, Ubi must know they have to continue with the theme of the costume. But like others have said, I'm sure they'll find a way to incorporate it into the modern-day version. for a game so focused on it's story and characters (especially desmond) it means a lot to me personally. if demond looked like a half assed afterthought design wise, it would seriously mess up what has so far being a great story and premis. he has all his fingers!!! boo! obviously not as dedicated as altair. I can't wait to see gameplay,they fix the things I hate in the first and that it's awesome and Ezio's design its more badass than Altair's. Korn, the thing with Desmond is, design could change yes as you said, that female assistant could lend him new outfit so he could sneak out or something. Or, they don't change anything (don't see why they should, he has a hood on his sweater anyway). He does NOT need a "bird" refrence at all, Desmond does not mean eagle so why would they go for a animal design? Ubisoft said Altair means eagle and they wanted eagle look, and considering Ezio has somewhat a "upgraded" outfit of Altair, they chose a name as "Ezio" to mean eagle. Why would Ubisoft decide both ancestor characters have a name that means eagle in their own period and languageand give the character animal design to go with it? My only theory is if Desmond gets a eagle like hood or a Altair/Ezio design is if Desmond's nationality was from another country,back to the roots of his birth, and he had another name until he changed it to Desmond. The possibilities are endless for Desmond, but we should focus on how AC2 turns out rather AC3. One step ahead is good, Ubisoft will figure the rest out. I think they changed the clan rules a bit as time went forward. I don't mind if Ubisoft decides to have a nice small assassin symbol tattooed on each of the assassins wrists to show they are the assassins. I remember Ubisoft said they cut off the ring finger so the blade could slide out through the missing ring finger, but how does that work when Ezio has both ring fingers attached? Uh, did you even play the first game? Perhaps you remember how you find out who the insider is? ;) Besides the assassins aren't some sort of Wolverine mutant race that shoots knives out of their limbs, Altaïr also had the assassin blade strapped to his arm, just like Eizo in this picture. The missing finger was simply the mark of an assassin. I didnt explain it more precise. I ment that when they cut off the finger that is a sign that they joined the brotherhood, when use their hand to shape it like a fist the blade is suppose to slide through the gap that the finger was located. It is stupid to miss the leather strap belt around arm and the hidden blade. However for a odd reason I don't understand why Ezio is not missing both of his fingers, wouldnt the blade cut the fingers when the shape the hands as a fist.